A salt variant of the strudel; one of many that I prepare, but probably the simplest. The filling is basically the same that I use for spanakopitaki , With the addition of a layer of breadcrumbs between dough and filling. However, brushing the leaves with olive oil instead of with the melted butter. 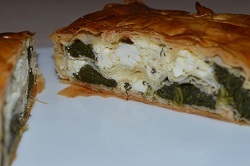 filla strudel dough, feta mixed with egg and spices, cooked spinach, drained and coarsely chopped, a little 'bread crumbs ... et voila! First, crumble the feta cheese with a fork and mix it with the egg, the spinach, cooked and chopped, and the spices. If desired, as in the pictures, you can keep the spinach separated from the rest and arrange them first on breadcrumbs and then covering them with the rest of the filling. Pour a little 'oil in a bowl, stretch the first sheet of dough on a large filla slightly damp cloth. With a brush (see photo) spread with oil. Lay on the second sheet (if it is folded dough and not rolled up, arrange the lines of the folds perpendicular to those of the first sheet. Adhere well and brush again with oil. Repeat the operation for the third sheet and for the fourth (the latter, however, will not go more brushed oil but covered by a fine layer of breadcrumbs which will absorb any moisture during cooking in excess of the filling. It is covered with the stuffing, leaving about three centimeters at the beginning and at the end about ten. Fold the 3 cm. free sull'impasto, you grab the towel and slowly raises making roll the strudel on himself. With the help of cloth she moved strudel (the end of the dough must go under!) On a baking sheet covered with baking paper. You sprinkle melted butter and then with the beaten egg. Bake at 180 ° (lower heat, ventilated) for 40 '. It churns and you need a few minutes later, still hot, slicing it on the table or next. Breadcrumbs can also be browned in butter before being spread on the dough. 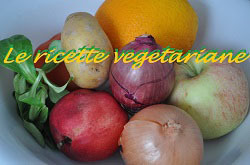 a richer filling can be obtained with the addition of an onion and garlic: chop finely and wither in the pan along with garlic, finely chopped or crushed; at the end of cooking add the spinach. Allow to cool and mix with the other ingredients as indicated in the standard recipe shown above.